The pace of change in the grocery market has rapidly accelerated over the last few years. Fueled by the growth of omnichannel retail, crowdsourced economies and consumer expectations for fast last-mile deliveries, omnichannel grocery is rapidly approaching a critical inflection point. Adoption rates vary widely by country and demography. For example, online grocery is predicted to grow by ~6x in North America, jumping from 2% to 12% of total spend, representing a $140 billion market by 2025. In parallel, delivery leaders like Amazon, Walmart and Instacart have taught customers to expect faster, more convenient, more transparent and less expensive grocery delivery. So now grocers are faced with a fundamental challenge: how to adapt to these changes and remain viable in the long term? A few eCommerce giants control a majority of US market share. First, of course is Amazon with its incredible logistical capabilities and delivery offerings, which have changed customer expectations and challenged grocery incumbents. Their impact on the grocery market extends well beyond their growing Whole Foods footprint. Amazon’s eCommerce empire, including Amazon Fresh and Amazon Now, provides billions of shoppers across the world with rapid, convenient access to all types of grocery and CPG. Similarly, Walmart’s impact on the North American grocery market is well established, as it has continued to innovate, improve and scale their online and omnichannel grocery offerings. From curbside pickup to crowdsourced delivery, warehouse automation and JetBlack’s concierge shopping, Walmart’s ongoing investment in omnichannel grocery has the mega-retailer well positioned for continued growth. The third leader on this list may surprise some grocers, but Instacart is projected to match Amazon in terms of global grocery market share by 2025. With an estimated 30% of the current US online grocery market, Instacart’s all-in-one solution provides many of North America’s leading grocers with a turnkey solution that bundles eCommerce, pick from retail and crowdsourced delivery. Their premium Instacart Express membership platform has attracted a lucrative and loyal following among consumers. With such a large percentage of the market share dominated by these three strong brands, grocers have to redouble their efforts to keep their own brand at the top of their customers’ to-do lists. So what can they do to achieve that goal? In response to growing online competition, a number of grocers have enhanced their retail shopping experience, introducing new mobile technologies, specialty grocery offerings and improved retail design. For example, many grocers have expanded self-checkout, introduced scan and go, and begun experimenting within cashier-less stores that mirror the Amazon Go experience. Grocers are also innovating with mobile apps that provide product sourcing information, recipes, loyalty programs and more. A single provider model provides an all-in-one, easy fix to the omnichannel challenge. For example, Instacart’s turnkey eCommerce, fulfillment and delivery services now cover (by their estimate) about 30% of the North American grocery delivery market. Instacart is even projected to maintain an on equal footing with the Amazon/Whole Foods! Similarly, many leading grocers around the world rely on a single fleet partner for all of their grocery deliveries. Some innovative grocers, such as Walmart, have developed or deployed omnichannel orchestration platforms. These technologies enable grocers to engage multiple teams, providers and technologies to deliver seamless omnichannel customer experiences. By carefully managing and automating the entire process, from delivery options at checkout to pick from retail or warehouse, curbside pickup and delivery, these platforms ensure optimal productivity and ROI. Instacart helped grocers enter eCommerce, but they also took control of the customer experience and data. On the surface, using a single provider seems like the perfect solution to the rapid market changes. Up until recently, most grocers had limited experience managing eCommerce, fulfillment or delivery. All-in-one providers took upon themselves the daunting challenges of marketing online grocery, building grocers eCommerce solutions and developing and training crowdsourced pickers and delivery personnel. These providers invested substantial sums optimizing every step and testing multiple pricing models to make the economics of omnichannel delivery work, both for them and the grocers they supported. But sticking with a single provider for all your delivery operations won’t work any more. As the market matures, single providers can become a strategic liability to grocers. They present a single point of failure; if their service goes down, their quality degrades or their rates go up, they leave grocers with no alternative provider or technology. Single providers typically maintain exclusive ownership of customer data and customer relationships and will typically maintain branding control over the eCommerce and customer delivery experiences. They are increasingly offering premium shopper subscription plans that have proven incredibly sticky, so that consumers end up building their relationships with the single provider rather than with the grocer. There is a reason that Deutsche Bank’s projections for the 2025 online grocery market has Instacart and Amazon tied for the #1 position. Instacart, for example, has built their business by leveraging local grocers as fulfillment centers. Retail-first grocers that do not take control over their omnichannel presence risk becoming local fulfillment centers for delivery and fulfillment providers building their profits on the grocer’s margins. The longer that grocers maintain their dependency on these providers, the harder it will be for them to take back control over their customer data and customer experience. Grocers need to own their customer relationships and shopper data, as well as deliver their own customer experiences, in order to improve their omnichannel margins and control their corporate destiny. 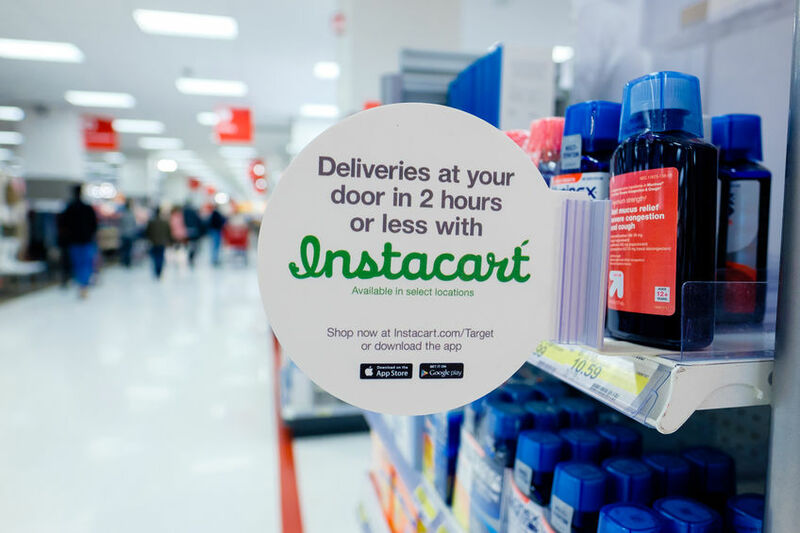 Single providers like Instacart may remain an important component in many grocer’s omnichannel fulfillment and delivery strategies, but should remain just that – a component of the grocer’s strategy, not a substitution for one.